Pay only P 1,647 a Month for 12 months. Or pay only P 3,119 a Month for 6 months. is simple and intuitive when used with Windows 8, recognizing up to 10 touch points at once. Designed to encourage collaboration and give productivity a boost, the Dell 21.5"
touch monitor offers a high level of user flexibility for work, school or entertainment. Ergonomic stand: Slide your display toward you smoothly and naturally to touch and type while tilting as much as 60°. Good for classrooms, home offices, clinics and other professional applications. VESA compatibility: You can also choose to mount your monitor on the wall or attach it to the Dell Single Monitor Arm1 to enjoy even greater viewing flexibility. Integrated connectivity: HDMI, Digital Visual Interface (DVI) and VGA ports enable direct connections to your desktop, laptop, camera, phone and other electronic devices to enhance almost any view. Great screen clarity: 16:9 Full HD with 1920 x 1080 (max) resolution; 3,000:1 (typical) high contrastratio; Mega Dynamic contrast ratio estimated at 8 million:1 (max); wide 178°/178° viewing angle for effective collaboration. Edge-to-edge glass: Big, clean panel for a smooth touch experience plus Image Enhance designed to sharpen images, improve color hues and boost color contrast. Dell Display Manager: Features Auto Mode, which offers a choice of preconfigured color settings to optimize the appearance of individual applications. Each application can have its own preset mode. Conceived with a high priority on environmental efficiency, the Dell 21.5" touch monitor features low power consumption and environment-conscious materials. 20W typical power consumption: Energy use is up to 28.57 percent lower than the previous-generation Dell touch monitor. 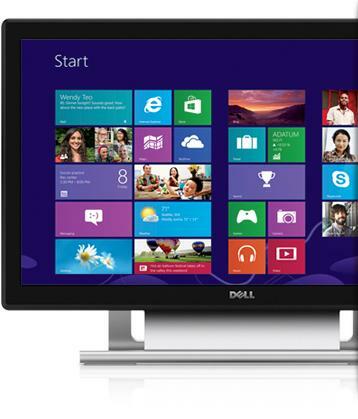 High environmental standards: ENERGY STAR® qualified and EPEAT® Silver rated, the Dell 21.5" touch monitor also features arsenic-free glass and a mercury-free LED panel. with outstanding clarity and usability in a clean, efficient design.